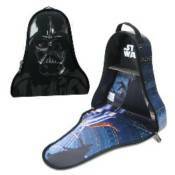 Star Wars ZipBin Darth Vader Carry Case: You don't know the power of the Dark Side until you've held the Star Wars ZipBin Darth Vader Carry Case in your hands! This Darth Vader case captures the force in your very own living room to help you master the dark side. With room to fits all of your Star Wars toys, the Star Wars ZipBin Darth Vader Carry Case wipes clean with a damp cloth for any unexpected spill. Ages 3 and up.